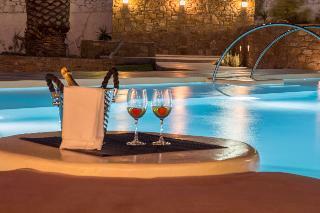 Offerte hotel MYKONOS. Scopri i nostri hotel e appartamenti più convenienti per il tuo viaggio. This comfortable hotel is situated in Ano Mera. With a total of 4 accommodation units, this is a nice place to stay. Both wired and wireless connections are available at Mykonian Breeze. Mykonian Breeze does not offer 24-hour reception. Unfortunately..
FacilitiesGuest accommodation comprises 20 rooms. Services and facilities at the hotel include a dining area and room service. Wireless internet access is available to guests. Travellers can buy daily essentials at the supermarket. Those arriving in ..
Property Location With a stay at Jewel Apartments in Mykonos (Ornos), you'll be minutes from Ornos Beach and close to Windmills of Mykonos. This apartment is within close proximity of Agios Ioannis Beach and Psarou Beach.Rooms Make yourself at home ..
FacilitiesThe hotel features various services and facilities, including a baggage storage service and a bar, for a comfortable and relaxing stay. Wireless internet access is available to travellers in the public areas.RoomsEach of the rooms is appoin..
Property Location When you stay at Dimele Rooms & Studios in Mykonos, you'll be near the beach and minutes from Fabrica Square and Aegean Maritime Museum. This guesthouse is within close proximity of Megali Ammos Beach and Tria Pigadia.Rooms Make yo..
LocationThe hotel is conveniently located about 4 km south of Mykonos Town. It is situated at Platys Gialos Beach, a cosmopolitan resort, with an organised beach with all the necessary tourist facilities. There is a bus station a few metres away and ..
LocationThis hotel lies in the area of Aryrena, just 800 m from the centre of Mykonos Town on the road to Elia Beach.FacilitiesThe air-conditioned hotel comprises a total of 30 rooms. A breakfast room, a bar and a TV room are available to guests of t..
FacilitiesServices and facilities at the hotel include a baggage storage service, a babysitting service and a childcare service. Wireless internet access is available to guests in the public areas.RoomsRooms feature air conditioning, a living room an..
FacilitiesThe wide range of services and facilities makes the hotel the ideal starting point for business and relaxation.RoomsEach of the rooms is appointed with air conditioning and a bathroom. Travellers can enjoy a good nights' sleep on the double..
Il complesso comprende 25 camere. Questo grazioso hotel Ã¨ il luogo ideale per sia per viaggi d'affari che per visite turistiche. L'Albergo dispone di una reception attiva 24 ore su 24. Gli ospiti potranno rilassarsi nello splendido giardino. L'Alber.. This guesthouse is within close proximity of Tria Pigadia and Agricultural Museum. With a stay at Manos Rooms in Mykonos (Mykonos Town), you'll be minutes from Fabrica Square and Aegean Maritime Museum.Rooms Make yourself at home in one of the air-..
Property Location Located in Mykonos, Adorno Suites is within a 15-minute drive of Windmills of Mykonos and Panagia Paraportiani. This hotel is 2.5 mi (4 km) from Archaeological Museum of Mykonos and 4 mi (6.4 km) from Paradise Beach.Rooms Make your..
FacilitiesA lobby and a reception are available to guests. The hotel offers various services and facilities, including a breakfast room and a bar, for a comfortable and relaxing stay. Wireless internet access in public areas allows travellers to stay..
With a stay at Vista Loca in Mykonos (Tourlos), you'll be minutes from Tourlos Beach and close to Archaeological Museum of Mykonos. This hotel is within close proximity of Mykonos New Port and Agios Stefanos Beach.Rooms Stay in one of 10 guestrooms..
L'Appartamento Ã¨ stato costruito nel 2015. L'Appartamento Ã¨ stato completamente ristrutturato nel 2015. Il complesso Ã¨ costituito da un unico piano principale. Il complesso comprende 3 camere. La struttura Ã¨ costituita da 3 suite, 3 appartamenti,..
Questo hotel, costruito in stile tradizionale delle Cicladi, si trova a Vryssi, a circa 600 m dal centro della cittÃ . La spiaggia di Megali Ammos si trova a circa 700 metri dalla struttura. Gli ospiti troveranno comodi collegamenti di trasporto nell..
FacilitiesServices and facilities at the hotel include a baggage storage service, a babysitting service and a childcare service. Wireless internet access is available to guests in the public areas. Those arriving in their own vehicles can leave them ..
FacilitiesWireless internet access is available to travellers in the public areas. Those arriving in their own vehicles can leave them in the car park of the accommodation.RoomsEach of the rooms is appointed with air conditioning. A sofabed ensures a..